Background and Aims: To our knowledge, no study has investigated neither how Moringa leaf extract modulates the immune system in normal nor diabetic subjects. Materials and Methods: Diabetes was induced by a single intraperitoneal dose of alloxan (150 mg/kg). A dose of 100 mg/kg of MO extract was orally administered to diabetic treated mice. The profile of glucose and insulin was evaluated. The activity of superoxide dismutase, catalase, glutathione peroxidase, and glutathione enzymes was determined. Liver function was monitored by measuring levels of alkaline phosphatase, glutamine pyruvate transaminase, and glutamic oxaloacetic transaminase. The percentage of single-or double-positive cells of each of CD8+/CD4+, CD117+/Sca-1+, Sca-1+/CD34+, CD11b+/Ly6-G+, CD11c+/CD11b+, and CD34+/CD117+ was investigated by flow cytometry in the peripheral blood. 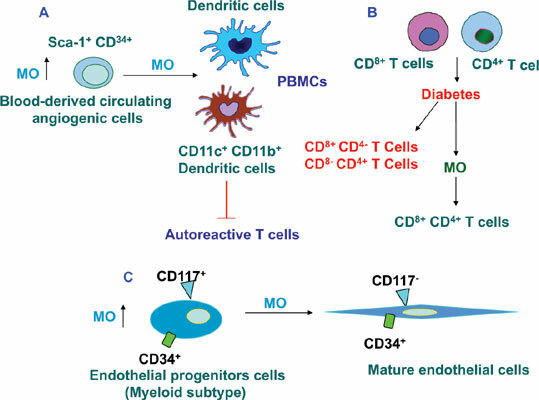 Results: MO promotes the activity of both CD4+ and CD8+ T cells in diabetic treated mice that may occur through the Sca-1+CD117+ stem cell factors. Administration of MO leaf extract enhanced the percentage of the endothelial progenitors (CD34+CD117+) and mature endothelial cells (CD34+CD117-). Moringa also increased the percentage of blood-derived circulating angiogenic cells (Sca-1+/CD34+). Discussion and Conclusions: This study shed light for the first time on how MO affects different immune cells; the knowledge gained may help to overcome diabetes and its complications. CD8+CD4+ T cells, lipid peroxidation, circulating angiogenic cells, immune modulation, Moringa leaf, diabetes.